We finally let the cows out onto the pasture this week, and all is right with the world again. 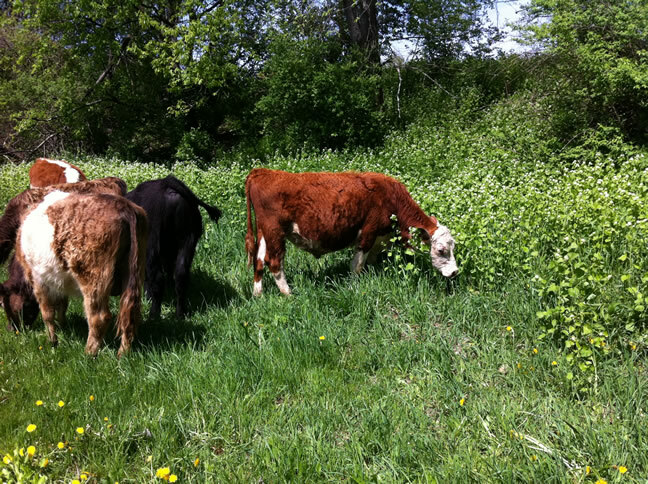 Here is a shot of their first day out—we put them in a paddock next to an embankment covered with garlic mustard. Garlic mustard is a state-listed invasive, but it is edible and nutritious. We thought that the cows might have a taste for it, and we might take credit for inventing a solution for this troublesome weed. No such luck. The cows waded deep into the stand of garlic mustard, and ate everything but. Still, we are not giving up hope. We might try Kathy Voth‘s technique for “educating” the cows. If it works, I might also see if I can use it to get my kids to eat their vegetables.